Each of the paddles is a 3D crab. The bottom crab is controlled using the left and right keys, while the other three are controlled by the computer using some AI. We'll divide the program into two components: the gameplay and the drawing. Code for the gameplay will be in game.h and game.cpp, while the 3D drawing code will be in gamedrawer.h and gamedrawer.cpp. * the x-z plane. There are balls and four crabs (paddles) in the game board. * ball hit the crab. Alright, now you know a little about what we'll see in game.h and game.cpp. Here, we have the CRAB_LENGTH and BARRIER_SIZE constants. Now, we have our Crab class, which represents a single crab. maximumSpeed is (you guessed it) the crab's maximum speed, in units per second. 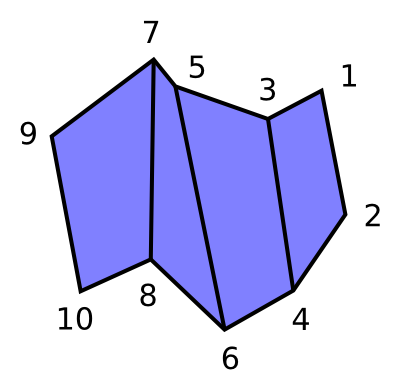 pos0 is the distance between the center of the crab and the corner on its right. It ranges between 0 and 1, but it won't reach 0 and 1 because of the length of the crab and because of the barriers. Note that pos0 ends with "0". This is to distinguish it from the pos method that we'll see later. You'll see this pattern a lot, where variables end with 0 so as not to conflict with methods' names. The dir0 field is -1 if the crab is going toward the corner on its right, 1 if it's going toward the other corner, and 0 if it's slowing down. So in the case of the human-controlled crab, this depends on whether the left and right keys are pressed. speed0 is the velocity of the crab. A negative number indicates that the crab is moving toward the corner on its right, and a positive number indicates that the crab is moving in the opposite direction. We have a field for the amount of time until we'll call the step method, which advances the state of the crab by a small amount of time. This is the constructor, which takes as a parameter the maximum speed for the crab. These are methods for returning the position, direction, and speed of the crab. The acceleration method returns the acceleration of the crab whenever it's speeding up or slowing down. setDir sets the direction the crab is heading, depending on whether the parameter is negative, positive, or 0. Now, we have a method that advances the state of the crab by some amount of time. Now, we have the Ball class, which represents a ball. There are fields for the radius and position of the ball. //z direction. The angle is always between 0 and 2 * PI. The angle0 field indicates the direction the ball is traveling. 0 indicates the positive x direction, while PI / 2 indicates the positive z direction. The field is always between 0 and 2 * PI. fadeAmount0 is the amount that the ball is "faded in". Usually, it will be 1, but if the ball is fading in or fading out, it will be some fraction between 0 and 1. isFadingOut0 stores whether the ball is currently fading out. //direction. The angle must be between 0 and 2 * PI. The Ball constructor takes the radius, position, and angle of the ball as parameters. Each ball is initially fading in. //the positive z direction. The returned angle is between 0 and 2 * PI. There are methods for returning the radius, position, and angle of a ball. //the positive z direction. The angle must be between 0 and 2 * PI. setAngle sets the angle at which the ball is traveling. //not 1 when the ball is fading in or out. The fadeAmount method returns the amount that the ball is "faded in". fadeOut makes the ball start fading out. isFadingOut returns whether the ball is currently fading out. advance advances the state of the ball by moving it. //by reaching a score of 0. Now, let's move on to the Game class, which keeps track of all of the information for a game. The crabs0 array stores the four crabs, as indicated by its comment. Note that a crab will be NULL if it's eliminated from play. balls0 is a vector of all balls that are in play. Note that we're using std::vector rather than vector because this header file doesn't have a line that says using namespace std;. You're really not supposed to have that line in a header file, because it pollutes the namespace...er...something. The scores array stores the players' scores. And, yeah, we have our timeUntilNextStep field. The handleCollisions method handles all of the collisions for balls, much like in the lesson on collisions. doAI uses a little AI to control the directions that the computer-controlled crabs are going. As usual, the step method will advance the state by a little time. //Constructs a new Game with the specified starting score. Now, we have the constructor. It takes as arguments the starting score and the computer-controlled crabs' maximum speeds. The latter can be used to set the difficulty of the computer crabs; a higher maximum speed will make them more difficult. The Game class also has a destructor. //the other corner, and 0 indicates to decelerate. The setPlayerCrabDir method sets the direction in which the human-controlled crab is going. The score method returns a particular player's score. advance advances the state of the game. //it has been eliminated by reaching a score of 0.
crabs and balls return the crabs and the balls that are in play. That does it for game.h. Let's go on to game.cpp, where we can see the code for the methods we just saw. At the top, we have some constants, beginning with everyone's favorite constant, PI. CRAB_STEP_TIME is the amount of time by which the crab's step method advances the crab. The TIME_TO_MAXIMUM_SPEED constant is the amount of time it takes a crab to accelerate from a dead stop to its maximum speed. If the center of the human-controlled crab hits a ball, it will go straight forward. If the exact left edge of the crab hits the ball, it will go at an angle of MAX_CRAB_BOUNCE_ANGLE_OFFSET to the left. That's the idea behind the MAX_CRAB_BOUNCE_ANGLE_OFFSET constant. This constant is the maximum speed of the human-controlled crab. These constants control how long it takes for a ball to fade into or out of play. Here, we have the radius and speed of the balls. NUM_BALLS is the number of balls that ideally will be on the board at one time. The GAME_STEP_TIME constant is the amount of time between calls to the Game class's step method. Here, we have our trusty ol' randomFloat function. On to the Crab class's constructor. It just initializes some of the fields. Here, we have the Crab class's step method. First, it adjusts the speed0 field. It either increases or decreases or increases the velocity by CRAB_STEP_TIME * acceleration(), up to the maximum speed of the crab, making sure to allow for stopping the crab if its direction is 0. In the remainder of the step method, we advance the position of the crab by CRAB_STEP_TIME * speed0, subject to not exceeding the barriers. These methods return the position, direction, and speed of a crab. acceleration returns the acceleration of the crab when it's speeding up or slowing down. This is just the maximum speed divided by the amount of time it takes to reach the maximum speed. The setDir method changes the direction of the crab by setting the dir0 field. advance advances the state of the crab by calling step the right number of times. Now, we have the Ball class's constructor. It just initializes a few fields. Here are the methods for returning the radius, position, and angle of a ball, setting the angle of a ball, returning the amount that a ball is "faded in", making a ball fade out, and returning whether a ball is currently fading out. Now, we have the advance method. First, we adjust fadeAmount0 if the ball is fading in or fading out. Then, we advance the position of the ball using a little trigonometry. The constructor for the Game class initializes some fields, including making some new Crab objects if the starting score is positive. The destructor deletes the crabs and balls. Now, we'll see some functions that we'll use for collision detection. intersectsCircle tells us whether (dx, dz) is within r units of the origin. collisionWithCircle returns whether a ball is colliding with a circle. It takes as parameters the distance to the circle in x and z directions, the sum of the radius of the ball and the radius of the circle, and the velocity of the ball. It operates by checking whether the ball intersects the circle and is moving towards the circle, based on the dot product of the displacement and the velocity. //x direction, and an angle of PI / 2 indicates the positive z direction. The reflect function...erm...well...just read the comments. The collideWithCircle function causes a ball to bounce off of a circle. It just computes the normal vector at the point of contact between the ball and the circle and uses the reflect function to figure out the new angle for the ball. collisionWithCrab returns whether a ball is colliding with a crab. It just computes whether the ball's position is within CRAB_LENGTH / 2 of the crab's position. collideWithCrab causes a ball to bounce off of a crab. If the ball hits the center of the crab, it will bounce off at an angle of (1 - crabIndex) * PI / 2. On top of that, we use some math the deviate the angle by some number between -MAX_CRAB_BOUNCE_ANGLE_OFFSET and MAX_CRAB_BOUNCE_ANGLE_OFFSET, depending on the spot where the ball hit the crab. Now, we have the method that takes care of handling all of the collisions with balls. We have a loop that runs through all of the balls. For each ball, we first check for ball-barrier collisions. We go through the four barriers, and if the ball is colliding with one, we call collideWithCircle to make it bounce off. Now, we check for ball-ball collisions. We go through all of the balls that are later in the balls0 vector; that way, we'll only try each pair of balls once. If the two balls are colliding, we'll call collideWithCircle on both of the balls to make them bounce off of each other. Note that sometimes, the ball bouncing is unrealistic. We're sort of forced to accept this limitation if we don't want the balls to change speed when they hit other balls. Here, we handle ball-crab and ball-pole collisions. Poles are walls that appear on an edge whenever a crab is eliminated. 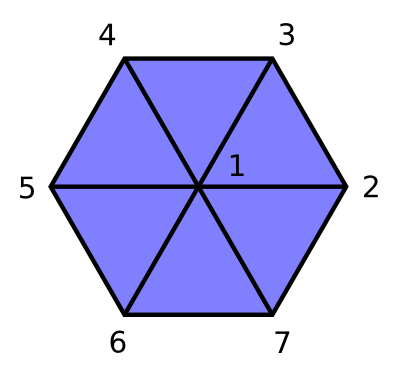 First, we figure out if the ball has exceeded any boundary of the board, and, if so, to which crab the boundary corresponds. Then, we check whether there's a collision and handle the collision if there is one. The stopPos function, which will be used by the doAI method, returns the position at which a crab would stop if it immediately started decelerating. It uses a bit of physics to find the right spot. Now we have the code for the AI that moves the computer-controlled crabs. The AI will actually be rather simple. The crabs will move toward the nearest ball. By "nearest ball", I mean nearest in the horizontal direction for the crabs on the left and right and the nearest in the vertical direction for the crab on top. So, the program loops through the balls, and every time it finds a new closest ball, it changes closestBallDist to be the ball's distance and targetPos to be the ball's position. We want to have the crab move toward targetPos. If after stopping the crab, the ball would be in the middle 70% of the crab, we'll just stop. This makes it so that we don't keep overshooting the ball and keep oscillating back and forth around the ball's position. If such is not the case, we'll accelerate towards the ball's position. Here's the step method. First, it advances the crabs and balls and handles collisions. Now, we're going to see if anyone's been scored on, and we'll get rid of any balls that have completely faded out. The newBalls vector stores all of the balls that haven't faded out, and after the loop, balls0 is updated to be equal to newBalls. The loop goes through the balls and checks whether they've exceeded one of the boundaries of the board. If so, that crab's score is reduced by 1, if it hasn't been eliminated yet. Then, if its score reaches 0, the crab is deleted and the appropriate element of crabs0 is set to NULL. Finally, the ball is faded out. If the game is not over, we'll try to add balls to the board until there are NUM_BALLS balls. To try to add a ball at the middle of the board, we check whether there's already a ball there, and if not, we add a new ball moving in a random direction. If the game is over, we make all of the balls fade out. Finally, we run the AI. These methods for setting the human-controlled crab's direction and returning a player's score are pretty simple. The advance method just calls step the appropriate number of times. The crabs and balls method return all of the crabs and balls that are in play. That does it for the gameplay code. The main drawing code for the program is in gamedrawer.h and gamedrawer.cpp. But first, we'll take a look at the MD2Model class, as there are a couple of changes. We'll look at md2model.h. //the indicated files. Returns NULL if there was an error loading it. First of all, there's a second parameter to the load method so that we can load multiple textures for a single MD2 model. There are four textures for the four crabs, which are different colors. The draw method takes parameters indicating the index of the texture we want to use and the particular time in the animation to use. Now, we'll move over to md2model.cpp and look at the changes there. Here's the new code for loading the textures. It puts the textures into a textureIds vector, which has replace the textureId field. Then, down in the draw method, we'll call glBindTexture(GL_TEXTURE_2D, textureIds[textureNum]) rather than glBindTexture(GL_TEXTURE_2D, textureId) when selecting the texture to use. so that the loop goes through the vertices in the opposite order. Now, we'll move on to gamedrawer.h. These lines of code tell C++ that the Game and MD2Model classes exist. We don't actually have to include everything in game.h and md2model.h; we just need to know that these classes exist. //this is the game that was just finished. The GameDrawer class will take care of drawing the game. It contains a Game object for the current game. 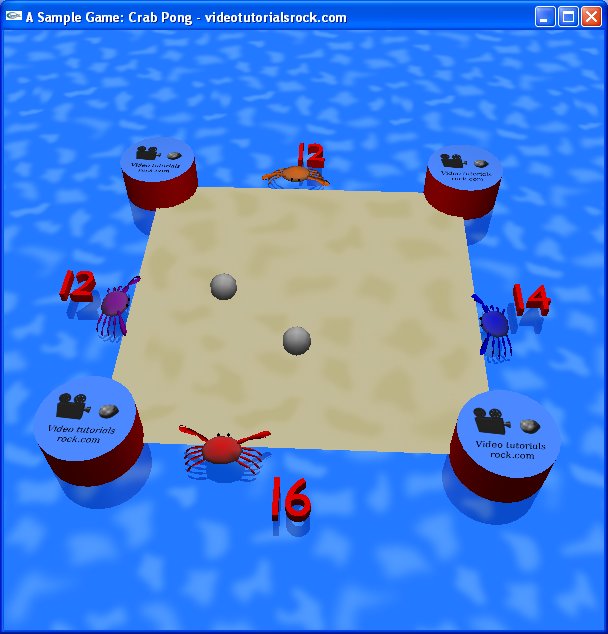 Before any game has been started, game is just a placeholder game with a maximum score of 0.
crabModel is the model for the crab. The barriers and the pole will be drawn using display lists. barriersDisplayListId and poleDisplayListId store the ids of their display lists. There's actually one display list that draws all four of the barriers by calling a display list for one barrier four times. sandTextureId and waterTextureId are the ids of the textures for sand and water. //disappeared after having been eliminated. When a player is eliminated, his crab shrinks until it disappears. The crabFadeAmounts field is the amount by which the crab is scaled for this shrinking effect. The animTimes array stores the animation times for the four crabs. //after being eliminated from play. oldCrabPos is the last known position of each crab. The array is used so that we don't forget where a crab was when we're making it shrink. Remember, a crab becomes NULL when it's removed from play. The water texture constantly moves forward. waterTextureOffset is the distance it has moved, modulo the size of each repetition of the water texture image. The isGameOver0 field is whether the game is over. This field is true only at the very beginning, before the first game is started. The playerCrabDir field indicates the direction the human-controlled crab is headed. timeUntilNextStep is the amount of time until we next call the GameDrawer class's step method. The setGame method sets the current game to the given Game object. It's called when a new game is started. These methods set up the display lists for drawing the barriers and for drawing a pole. The setupLighting method sets up the ambient light and the light sources. //balls are being drawn rather than the balls themselves. Now, we have some methods for drawing stuff. Each of these methods has a isReflected parameter indicating whether we are drawing the reflections or the objects themselves. If we're drawing the reflections, which we do using a call to glScalef(1, -1, 1) to reflect about the y axis, we'll want to make sure that GL_NORMALIZE is enabled. //Draws all of the objects that have reflections in the water. //drawn rather than the objects themselves. drawReflectableObjects calls the four methods we just saw. These methods take care of drawing the sand and the water. The drawWinner method draws some text whenever there is no game in progress. It draws some insructions text, as well as the winner of the previous game, if there was a previous game. Now, we've got our constructor and our destructor. //board&apos;s corners are at (0, 0, 0), (0, 0, 1), (1, 0, 0), and (1, 0, 1). This is the main drawing method for the GameDrawer class, the method that draws everything. The advance method is for advancing the state of the game. The setPlayerCrabDir method sets the direction the human-controlled crab is going. isGameOver returns whether the game is over. //Starts a new game with the specified starting score. The startNewGame method is called to start a new game. initGameDrawer is supposed to be called at the beginning of the program, while cleanupGameDrawer is supposed to be called at the end. As we'll see later, the former just calls t3dInit to set up the text-drawing functionality, while the latter just calls t3dCleanup to dispose of the text-drawing functionality. Now, we'll go to gamedrawer.cpp to see the implementation of all of these methods. We have a main course of PI, followed by a helping of STEP_TIME, which is the amount of time between calls to the GameDrawer class's step method. These constants indicate the duration of a single loop of the walking and standing animations for the crabs. CRAB_FADE_OUT_TIME is the amount of time it takes an eliminated crab to shrink to nothing. The circular ends of the barriers and the poles are drawn using NUM_BARRIER_POINTS and NUM_POLE_POINTS at the outside respectively. BARRIER_HEIGHT is the height of each of the cylindrical barriers. These constants indicate the radius of each pole and the height above the ground of the centers of the poles. This constant is the amount by which the human-controlled crab is translated in the z direction. The other crabs are translated similarly. The water moves forward at a rate of WATER_TEXTURE_SIZE units per WATER_TEXTURE_TIME seconds. Each repetition of the water texture is WATER_TEXTURE_SIZE units square. This is the opacity of the water, which is blended onto the screen in order to have reflections. I'll skip over the loadTexture function to the constructor for the GameDrawer class. In the constructor, we set the game to be NULL and the human player's crab's direction to be 0. Then, we call startNewGame to set game to be a placeholder game with a maximum score of 0. We set waterTextureOffset to 0. We call MD2Model::load to load the crab model. We call setupBarriers and setupPole to set up the display lists for the barriers and poles. Then, we load in textures for sand and for water. The destructor just deletes the game object. The setGame method deletes the old game if there was one, then sets the game field to be the new game. We set the human player's crab's direction to be playerCrabDir, and set timeUntilNextStep to 0. Then, we determine whether the game is already over, that is, whether we're using a placeholder game. After that, we set some initial values for the animTimes, crabFadeAmounts, and oldCrabPos arrays. Now, we have the setupBarriers method, where we make the display list for the barriers. We load in the texture for the top of the barriers. Then, we're going to set up a display list for one barrier, which we'll call four times in the display list for all four barriers. You'll notice there's a call to glMaterialfv. We'll actually be using materials to make the barriers shiny. So, with a bit of trigonometry, we get the appropriate points for drawing the circle. In the same manner, we draw the bottom cirlce. So, with more trigonometry, we determine the points for the cylinder part. Here, we set up the display list for drawing all four barriers at once. We disable GL_COLOR_MATERIAL so that we can use the glMaterial functions to make the barriers shiny. We set up a little shininess with calls to glMaterialfv and glMaterialf. Then, we call the display list for drawing one barrier four times. Then, we re-enable GL_COLOR_MATERIAL, and eliminate the specularity we just added. The setupPole method makes a display list for displaying the cylindrical poles. It makes a cylinder in much the same way that setupBarriers does so. In the step method, we start by calling the Game's advance method. Then, we change the waterTextureOffset field to move the water forward. Now, we'll loop through the crabs to update oldCrabPos, crabFadeAmounts, animTimes, and isGameOver0. Each element of animTimes is increased a little if the corresponding crab is standing or walking in the positive direction and decreased a little if it's walking in the negative direction, to reverse the walking animation. Each element of crabFadeAmounts is decreased a little if the corresponding crab is NULL. isGameOver0 is set to true if either the human player's crab has disappeared or all of the other crabs have. The setupLighting method sets up ambient lighting and adds four lights above the four corners. This code uses a little trick: that GL_LIGHTn is the same as GL_LIGHT0 + n. For example, GL_LIGHT2 is equal to GL_LIGHT0 + 2. In drawCrabsAndPoles, we'll go through and draw all of the crabs and poles. First, we translate and rotate to the correct side of the board. Then, we draw the crab model, if the crab hasn't disappeared yet. Note that if crab is NULL, we'll scale the crab by crabFadeAmounts[i], in order to make the crab shrink when it's eliminated. If the crab has been eliminated, we draw a pole. If we're drawing the pole itself, rather than its reflection, then GL_NORMALIZE doesn't have to be enabled, so we disable it. drawBarriers just calls the display list for the barriers, disabling GL_NORMALIZE if possible. The drawScores method draws the players' scores by translating to the appropriate position and drawing strings with each player's score using calls to t3dDraw3d. The drawBalls method draws each of the balls. Note that if the ball is a little faded out, we're using alpha blending to draw a transparent ball. Also, note that the ball is drawn a little above the water. If they weren't, rounding errors might cause parts of the balls' reflections to appear above the water. drawReflectableObjects just calls other drawing methods. This method takes care of drawing the sand. Note that the sand is a little above the water, which is at z = 0, so that it isn't submerged by the water. drawWater draws the water. We're disabling lighting on the water. As in the floor of the animation lesson, the water is a giant quadrilateral that's supposed to look like it extends forever in each direction, and the water is moved forward just by messing with the texture coordinates. drawWinner draws some text if the game is not in progress. If we've started a game already, and the game is over, we draw text indicating the winner by calling t3dDraw3D. t3dDraw3D("Press ENTER for a new game\nPress ESC to quit\n"
If there is no game in progress, we'll draw some instructions. Note that the instructions string spans multiple lines. You can do that in C++. C++ will interpret it as one string: "Press ENTER for a new game\nPress ESC to quit\n(Use left and right to move)". And now (drumroll please), we have our main drawing function. It sets the background color to sky blue. This color shows up in the reflection on the water. Then, we draw the reflections, by using glScalef(1, -1, 1) to reflect everything. Then, we draw everything normally. Note that when we're drawing the reflections, we cull the front faces. That's because reflecting about the y axis changes the faces' vertices from being given in counterclockwise order to their being given in clockwise order. The advance method calls step the proper number of times. The setPlayerCrabDir method sets the playerCrabDir field and calls the setPlayerCrabDir on the game. isGameOver simply returns the isGameOver0 field. The startNewGame method starts a new game by setting the current game to be a new Game object. As promised, initGameDrawer and cleanupGameDrawer just call t3dInit and t3dCleanup. We have pi, as well as a constant indicating the number of seconds between calls to update. You can increase this constant if your computer is too slow to run at 40 FPS, so that at least the speed of the game will match the drawing speed. Ideally, in each call to update, we'd measure the amount of time since the last call to update and advance the game by that amount of time. That way, the speed of the game would automatically match the speed of the computer. But we're just doing things the easy way. gameDrawer is the GameDrawer object we're using. isLeftKeyPressed and isRightKeyPressed will keep track of whether the left and right keys are currently being pressed. //repeats. Used to have the camera angle slowly change. If you watch the program, you'll notice that the camera angle is actually changing very slowly. The rotationVar variable will be used to make this happen. rotationVar starts at 0, then climbs to 2 * PI, then jumps back down to 0 and repeats. The cleanup function just has to delete gameDrawer and call cleanupGameDrawer. The enter key, &apos;\r&apos;, starts a new game if none is currently in progress. The left and right keys don't have ASCII equivalents, so we can't handle them in the handleKeypress function. We need a new function called "handleSpecialKeypress", which takes an integer key rather than a character key. A key of GLUT_KEY_LEFT indicates the left key, while GLUT_KEY_RIGHT indicates the right key. The function just updates isLeftKeyPressed and isRightKeyPressed and sets the direction the human player's crab is going. This function will be called whenever a special key is released. Like handleSpecialKeypress, this function will update isLeftKeyPressed and isRightKeyPressed and set the direction of the human player's crab. This is the initRendering function. Note that in handleResize, we're indicating not to draw anything closer to the camera than 0.02 units or farther from the camera than 5 units. In drawScene, we translate a little, then rotate by 50 degrees to have a camera angle between an overhead view (90 degrees) and a straight-on view (0 degrees). Then, we translate to the center of the board and rotate a little using rotationVar. The amount of rotation will oscillate slowly between -3 and 3. Then, we translate back to the corner of the board and call draw on the GameDrawer. The update function advances the GameDrawer and increases the rotationVar variable a little, decreasing it if it exceeds 2 * PI. The main function is mostly familiar stuff. We seed the random number generator and set gameDrawer to be a new GameDrawer object. However, there are two new function calls: glutSpecialFunc and glutSpecialUpFunc, which let GLUT know the functions that we want to use to handle when a special key is pressed or released. And now, we're done! We've made a fairly cool 3D game, the culmination of all the OpenGL we've learned.